This is the view I woke up to this morning on the last day of school before the Christmas holidays. 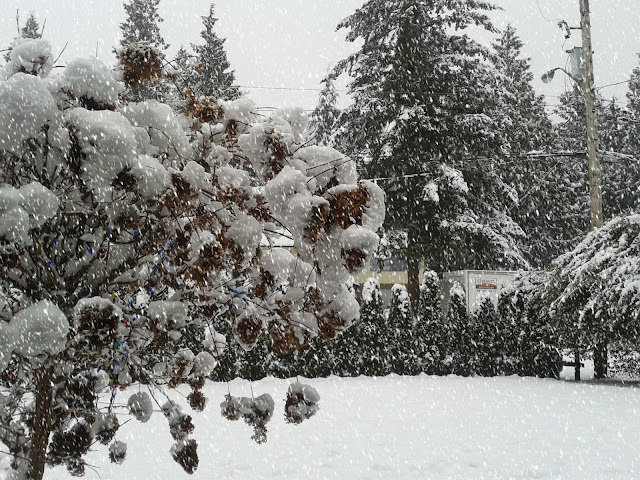 Hellooooo snowfall! It was my daughters' excited shouts that caused me to run to the window to see it. What a great way to start winter break! I just had to survive the slippery drive to school! 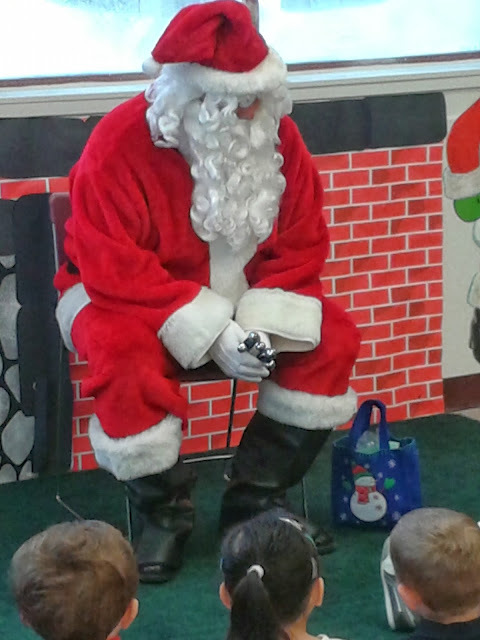 Being the last day before break, it was Christmas party day with all the parents attending to see their little ones sing. Or not sing! One never knows how it will go! After the concert, we had a potluck lunch, and then we set out a few activities for the kids and parents to do together while mingling and waiting for our surprise Santa visit. We had a Christmas Photo Station. We set up some chairs in front of a backdrop for the people being photographed to sit on and then laid out a variety of dress-up props. I think the most popular signs were the Naughty and Nice ones. 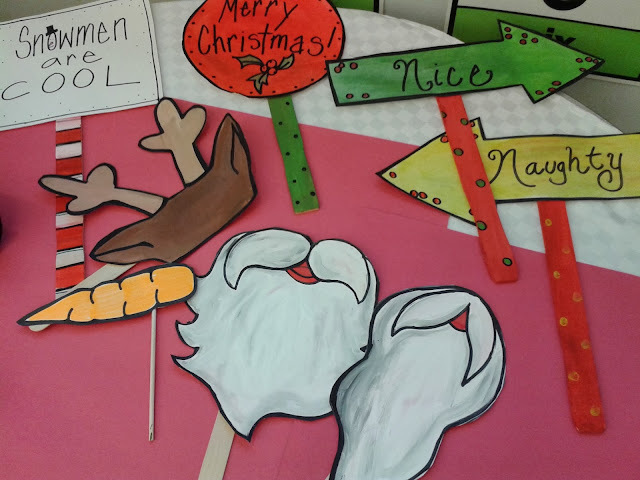 The kids loved to hold the Naughty sign with the arrow pointing at mom or dad! 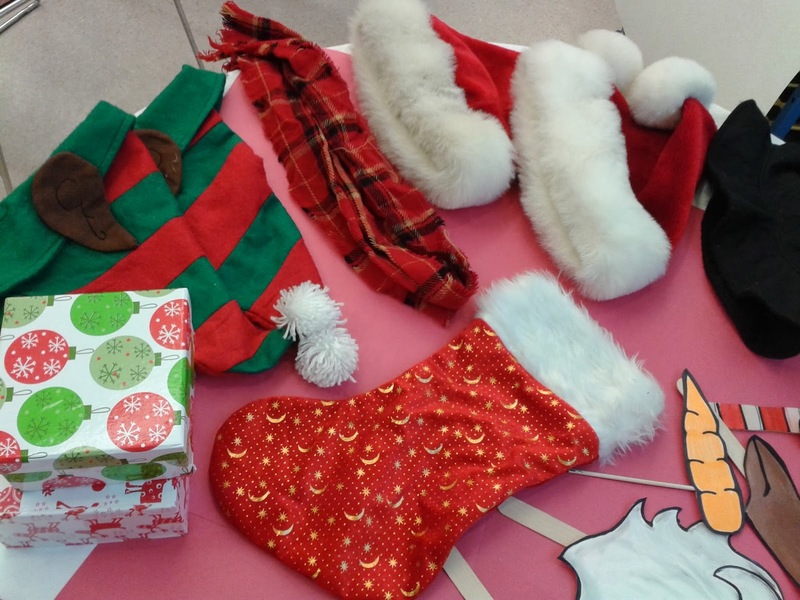 Other props included snowman hats, elf hats, silly glasses, Santa hats, a scarf, plastic candy canes, and gift boxes. The Photo Station was lots of fun and a great way to involve the parents. They like to be silly too! And of course, so do the teachers! Activity option #2 was the Snowball Toss station. This is a simple game that's quick to prepare and lots of fun for the kids. 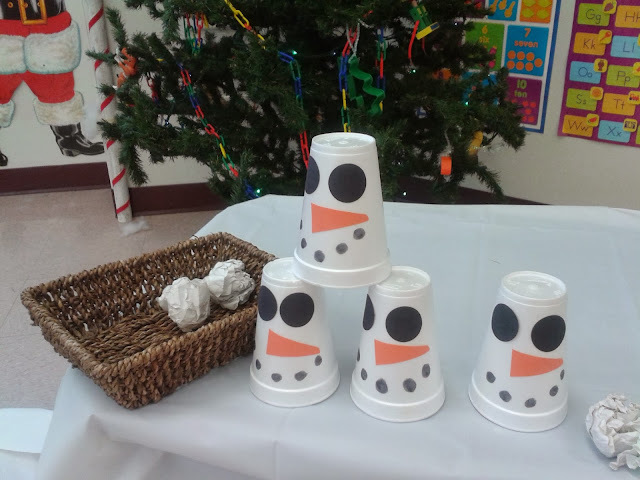 The cups were styrofoam so it was easy to knock over the pyramid with the paper "snowballs." Our last activity was the Decorate a Christmas Tree station. 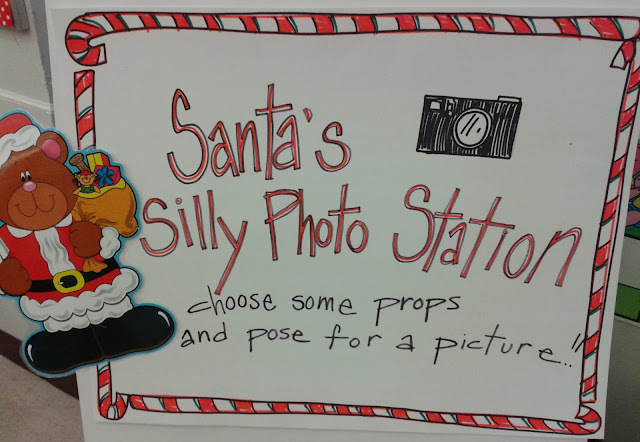 The props for this station were created for the preschool by my "crafty" little daughter, Sasha. 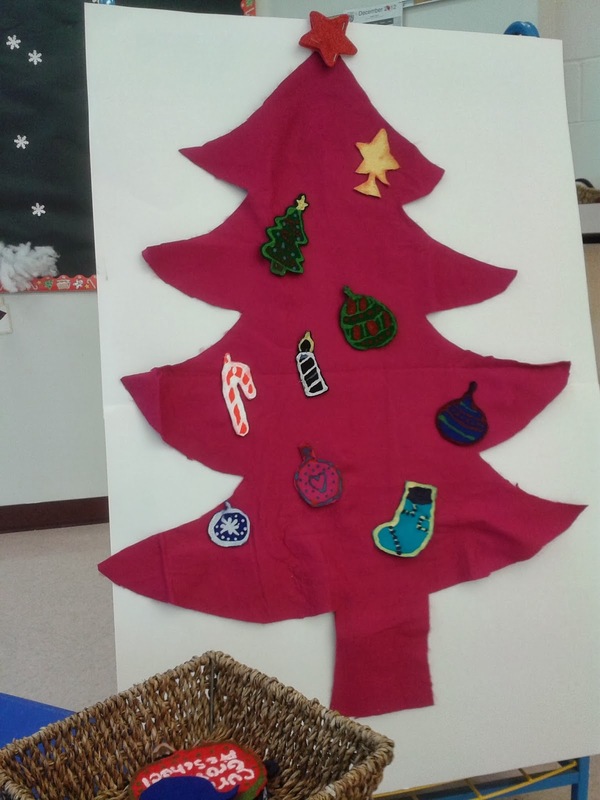 The tree and decorations were made out of felt fabric and then painted with acrylic paint. After we played some games, the big guy made a visit and handed out some bags of sparkly reindeer food. Then it was present time! One gift for the parents that the kids had made (view here) and a Scholastic book for each of the kids from us teachers. 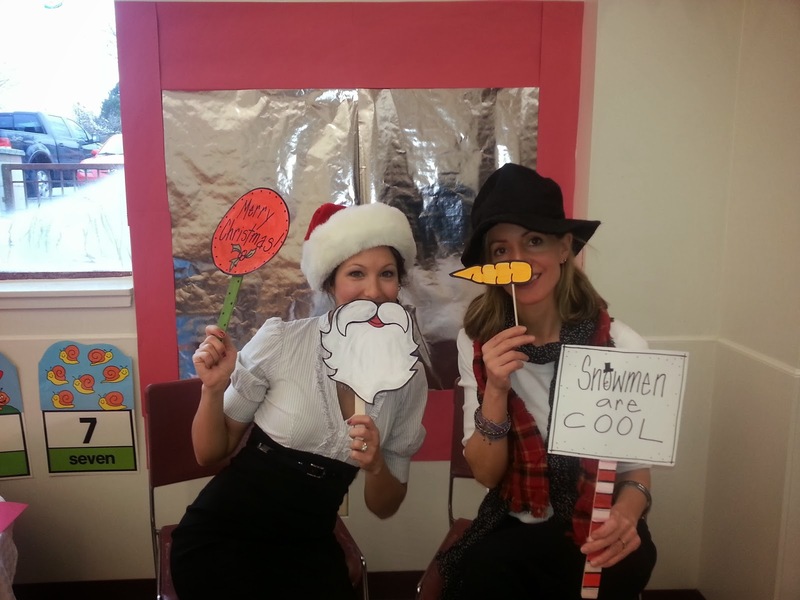 The party was festive and fun and a great way to end the school year of 2013! I hope you all had a great party day, too. Now it's time for a fantastic holiday and lots of time to rest and relax. I have already worked through a box of chocolate coconut balls given to me by one of the parents. YUM! Ah, the perks of being a teacher!